Learning the ins and outs of the benefits of dash cams is the first step to knowing which model is the right one for your vehicle. More car owners are installing dash cams, such as the Actionpie Dash Cam X1LD, to help protect themselves and their family members in the event of an accident or single-vehicle collision. 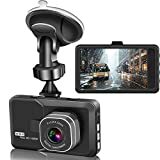 No matter if you want a dash cam for yourself or for your teenagers, this is one of the many models you can choose from an array of models that are ideal for beginners. The Actionpie Dash Cam X1LD has almost everything that you would expect a regular dash cam to have, which makes it a good option for most vehicles. There are a couple of features that will require updates, but it is a reliable choice for someone who has never been able to use a dash cam in the past. Another thing that makes the Actionpie Dash Cam X1LD unique from other competing models is that once it is installed, it’s relatively easy to use which is ideal for the less tech-savvy drivers who still want the peace of mind of being recorded while on the road. It offers a sleek and modern appearance, especially when compared to bulkier dash cams, which always gives you the ability to stealthily install your camera to capture any activity surrounding your vehicle. As mentioned, the Actionpie Dash Cam X1LD is recommended for people who have never had the opportunity to use a dash cam in the past. It doesn’t have a robust number of useful features when compared to high-end models, but it has all the basic functions that you’d expect a beginner’s dash cam to have. This can make it perfect to keep your teens safe while they’re using their personal or family vehicles. The Actionpie Dash Cam X1LD is also an excellent option for elderly drivers who aren’t interested in working with all the bells and whistles that are typically integrated into more modern dash cams. This unit serves its purpose by keeping you sufficiently protected in the event of an unpredictable collision or illegal activity surrounding your vehicle. The Actionpie Dash Cam X1LD comes with plenty of accessories to help you install the unit as easily as possible. You’ll receive the dash cam as well as a suction cup mount so that it can be installed in the front or rear windshield and a cable tray to keep the cables organized and out of the way. You’ll also be able to use the in-car charging cable to make sure the camera is ready for recording at all times. Aside from those accessories, you’ll also receive a user manual with instructions for installation and to learn the different functions included in the camera. FULL HD RECORDING　and Night Vision： 1080P high speed video recording captures fast moving scenes and creates high resolution images in high speed. Night vision is a key indicator of a dash camera's performance.X1 Dash Cam features an all-glass high-resolution lens, high sensitivity image sensor to guarantee excellent night vision. Full-HD recording: With a 1080p native resolution, you’ll be able to capture high-quality images and video with little effort. Also, the all-glass HD lens and image sensor help to capture pristinely defined media in low lighting conditions. Loop recording: With the ability to activate the loop recording feature, the camera will automatically overwrite old videos and images once your memory card is full. Wide-angle lens: Although the lens in the Actionpie Dash Cam X1LD isn’t as wide as other dash cams on the market, it still captures up to 120 degrees of action surrounding your vehicle. Poorly written instructions: Unfortunately, the installation instructions for the Actionpie Dash Cam X1LD are poorly translated and difficult to understand. Even though the installation is relatively straightforward, you will have to find an alternative source for instructions. Cheaply made mounting accessories: The mounting accessories, primarily the suction cup, is constructed out of low-quality plastic, which can cause the mount to snap in half if installed incorrectly. It would be far more beneficial to research other compatible mounting options instead of using the suction cup included with the camera. Easily breakable: It’s best to avoid dropping the Actionpie Dash Cam X1LD, as it will easily break if it experiences an ample amount of pressure or if it absorbs high levels of shock absorption. It’s recommended that you purchase an exterior case so that you can safely house the camera in a shell that will absorb shock from accidental drops. Using the Actionpie Dash Cam X1LD is easy once you have the unit correctly installed. It’s recommended that you find the ideal placement for the camera prior to wiring it to your car battery or fuse box, as this will help to make sure it’s not in a distracting location. Once the camera has been wired to your desired power source, you can then turn the unit on and cycle through the different features with the help of the touchscreen menu. The Actionpie Dash Cam X1LD is designed to record on loop mode as default, so in most cases, you won’t need to make any adjustments to the settings as it will be ready to use. At this point, all you have to do is turn on your ignition, and the camera will automatically turn on and begin recording. Finding an alternative dash cam to the Actionpie Dash Cam X1LD means you’ll want a unit that is equally as user-friendly but constructed using higher quality materials. The YI 2.7” Full HD Wide Angle Dashboard Camera is a great option as it offers a couple of extra features and is more reliable once installed. With the YI dash cam, you’ll be able to take advantage of the ADAS (Advanced Driver Assistance System) which uses highly advanced algorithms to make sure that you’re driving safely and offers real-time lane departure feedback. Also, the installation instructions are easier to follow, and the mounting suction cup has been tested and withstands an ample amount of shock without breaking apart. All in all, the Actionpie Dash Cam X1LD is a useful dash cam for first-time users who are interested in learning about the features that you will receive with most dash cams on the market. Even though it’s not the most prestigious model in terms of reliability and longevity, it will surely help you learn your way around this innovative technology to ensure that you and your vehicle are protected in any kind of accident.